Alex Delaware is back! I’m a huge fan of Jonathan Kellerman’s mystery series featuring child psychologist/consulting detective Alex Delaware. I’d been disappointed by the last few books in the series, because they felt more like police procedurals with Alex being a fairly generic amateur detective instead of the psychology expert that made me love the series in the first place. However, I’m happy to say that Victims, the latest in the series, is the Delaware series at its best. We have the creepy psychopathic killer, and Alex Delaware providing psychological insights that, at times, are almost uncanny. Alex and his friend, Detective Milo Sturgis, are called in to investigate the murder of Vita Berlin. A thoroughly unpleasant woman, Vita had had a lot of enemies, but even the people who hated her admitted she didn’t deserve such a gruesome (think Jack the Ripper) death. Alex is struck by the clinical nature of Vita’s disembowelment; he is reminded of a child he’d once counselled who cut up animals not because he took pleasure in it, but because he’d been curious. Here is the Dr. Alex Delaware-type insight that I’d been missing from the more recent books in the series — Kellerman may have put them in, but it hadn’t felt as essential to the storyline for a long time. So when I read that, and I knew Alex and Milo were hunting a truly disturbed mind, I knew Victims was going to be classic Kellerman. More victims are then discovered, and none of them are linked, as far as Milo’s team can tell. Who is the killer, how is he choosing his victims, and why is he killing in the first place? It’s a dark, twisted, creepy psyche, which gives Alex lots of opportunities to use his psychology training. Victims is a very chilling book. I made the mistake of beginning it at night, and I ended up reading until about two in the morning. I very reluctantly went to bed only because my eyes were literally closing, despite my mind still racing ahead and trying to figure out the solution to the mystery. I was also sufficiently creeped out by the killer that I had to gather up the courage to go into the kitchen for a glass of water. Granted, I’m a major chicken, but somehow the idea of a person who would kill others not because he is sick enough to enjoy killing, but because he is fascinated by human biology just makes me shiver. Victims made me realize how much creepier human monsters are than supernatural ones. Then, as I learned more about the motivations behind the killings, the book just got even scarier. 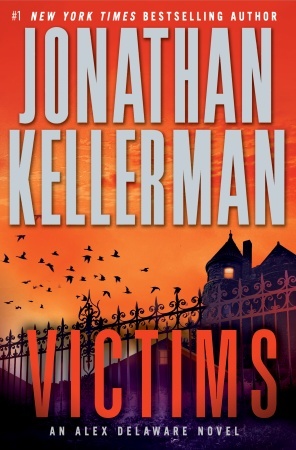 This feels much darker and more disturbing than previous Delaware novels, and I think it’s just because the antagonist here seems so much colder and more monstrous than I remember from Kellerman’s other books. Alex Delaware fans — this book is definitely recommended. New to Alex Delaware — Victims is a good place to start. WIN A COPY OF VICTIMS! An Alex Delaware fan or interested in trying out the series? Random House Canada has kindly provided me with a finished copy of this book to review, and I’d love to pass it on to a fellow mystery fan! What is your favourite mystery series and why? This entry was posted in Book Reviews and tagged 50BookPledge2012, Fiction, Giveaway, Mystery, Random House by Jaclyn. Bookmark the permalink. I have so many favourite mystery series! Where to begin? J.P. Beaumont by J.A. Jance, Peter Decker and Rena Lazarus by Faye Kellerman, Harry Bosch by Michael Connelly and the list goes on and on. I have had the Alex Delaware series on my wish list for a long time. Tara – Great picks! I personally prefer Jonathan Kellerman’s books to Faye Kellerman’s, though that may just be because I like psychologist detectives. Haven’t tried J.P. Beaumont yet; will definitely have to check him out! Lindsay – I’ve heard so much about the Jack Reacher series! I should totally check him out! 🙂 Thanks for commenting! My first and favourite mystery was TEN LITTLE INDIANS, which has been renamed AND THEN THERE WERE NONE by Agatha Christie. The tension in the novel drove me nuts and I scared myself silly! As a female mystery writer, Agatha was both a genius in hinting enough to drive you to the next page in anticipation to surprising you at the outcome of your misinterpretation. I’ll read her again and again…but only with all the light on! I’ve never entered a contest that expired. But I’m large on firsts; Delaware is one of the more compelling protagonists in mystery/crime fiction. But Harry Bosch and Elvis Cole(with da Pike)gives the man much run for the money. But on a desert island scenario I’d have to go with Mr. Kellerman, but I would choose an island whose library also carried Mr. Connellys’ works. One is allowed to cheat a bit regarding expired contests. Didn’t know that? Robert’s Rules part F.
Enjoy your day and your reading…..